Cops and soldiers usually get along OK. So why would active duty police officers have a problem with the police officers and combat veterans that allegedly make up the ranks of the “Oath Keepers” patrolling the streets of Ferguson? Like most of these outfits, there’s no way to tell who’s really who and even less in the way of vetting the membership. “Their presence was both unnecessary and inflammatory,” St. Louis County Police Chief Jon Belmar told reporters. That doesn’t seem very friendly. But maybe the hostility towards the Oath Keepers has to do with appearances. After all, it’s pretty confusing for Joe Public, or people that don’t live in the U.S. to see heavily armed volunteers running all over the place during an official state of emergency. Interestingly, many discussions between the Oath Keepers and predominantly black protestors centered on tax issues—which, of course, have become part of a national debate about best patterns and practices in policing models. For now, local law enforcement is playing Mr. Nice Guy with the group. 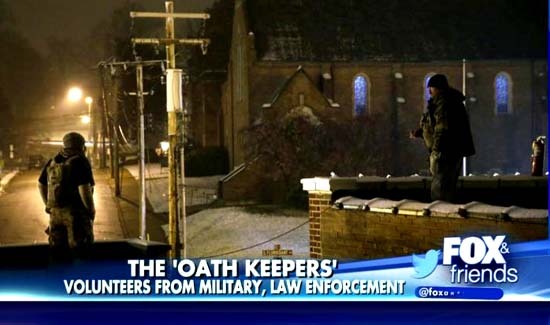 But that statement was made almost a year ago when the Oath Keepers took up positions on roofs and elsewhere shortly after the initial unrest. At any rate, watching the members talk with protestors and the media is entertaining, if nothing else.